Storytelling throughout history was the passing on of the essence of an event. Specific details were not necessary. It was a person’s emotional interpretation of a significant occurrence. The heart of the story was what was important. These stories would get passed down by word of mouth, so they altered along the way. I recently heard on the science program, Nova, that every time we recall a memory, we edit it. It becomes less and less accurate because our imagination fills in bits and pieces of things that may have happened, and then those imagined additions become part of the memory. Today, we do more reporting than storytelling. We want specific details—time, dates, and numbers. When I wrote Sunday feature articles for the Chicago Tribune, three things were to be included: real voices, meaningful quotes, and statistics. Stories needed to be about people with real concerns, told in their own words, and backed up with relevant data. Statics are an important element in substantiating a story. They tell a level of truth in numbers. Although it was my least favorite college class, I do realize its significance from sports and politics to science and demographics. However, in all reality, even those numbers are a matter of interpretation and can be twisted. WordPress offers a stats page for each of my blogs. It shows the number of views, likes, visitors, and comments for every post and even where those viewers are located. These numbers give me an idea of who is reading my blogs and whether they are of interest to anyone. There is a wide variation of numbers for many reasons including relevancy of content, writing style, and the time and day of posting. 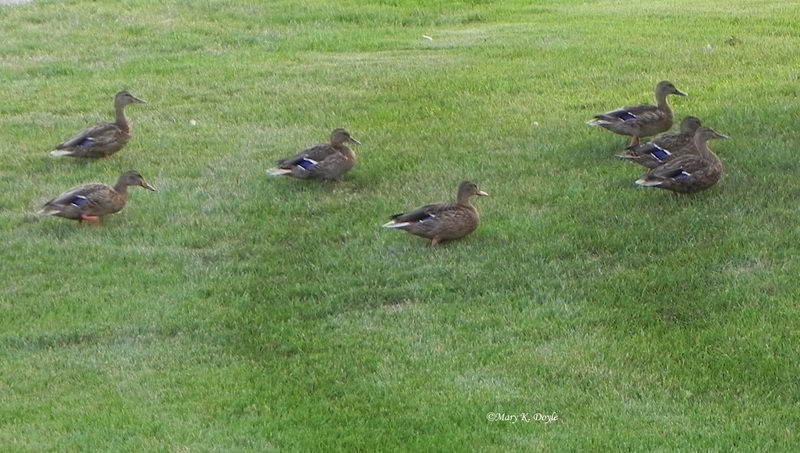 My most viewed post ran back on August 19, 2013. It had 777 views on WordPress plus countless others via Facebook reposting. Experience has taught me that there are no results without action. You have to dream, develop your idea through research and investigation, and then make it happen with time and effort. Consider what it will take to get it. Decide if you are willing to pay the price. Carol’s steps sound simple, but there are many people who go into business without thinking these things through to begin with and then cannot, or do not want to, do what they need to do to achieve their goal. Another one of the 52 women highlighted in Mentoring Heroes, Harriet Gerber Lewis, who was Chairman of the Board of Gerber Plumbing Fixtures, Corp., said one of the most important business lessons she learned from her father was to respect every employee. Each one is an integral part to the company’s success. Making it easy for people to do what you want them to do is a secret to success. Business cards are one such way of achieving this. If you want someone to do business with you, put your contact information in their hands. Allow them to keep you in mind when they need your services. 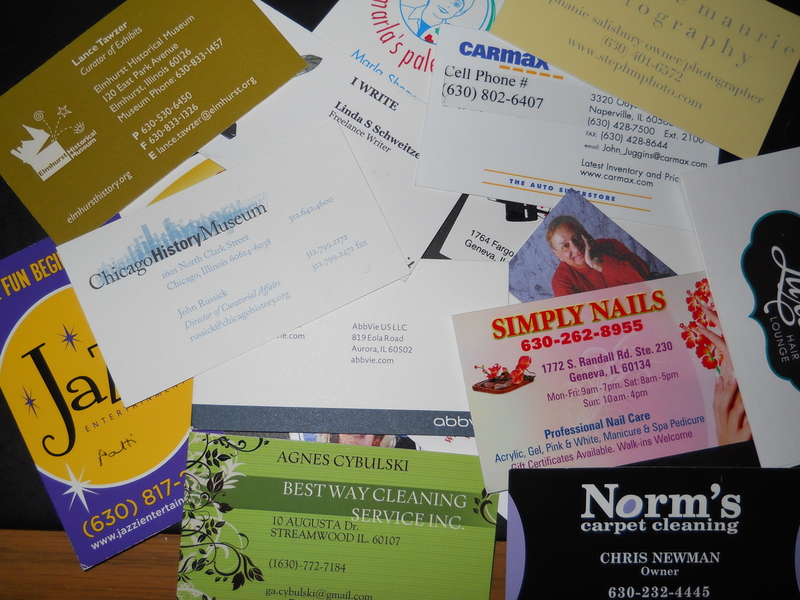 Business cards are simple networking tools that need only contain your name, phone number, email address, and website address, if you have one. 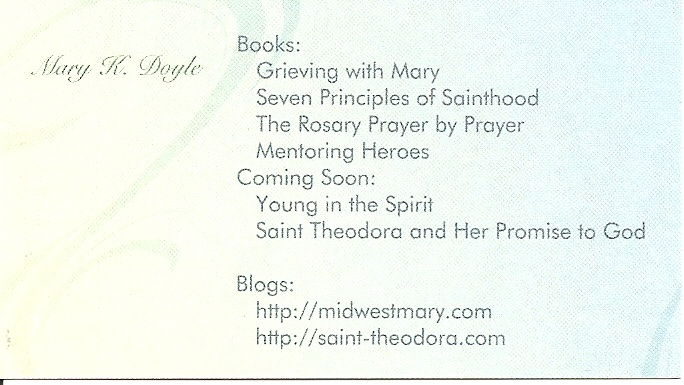 I also include a list of my books and blogs on the back of my card. Card design should reflect your business. If you work in the arts and entertainment fields you may want a burst of color or design but traditional business should be professional and uncluttered. Again, the point is having information that is clear and easy to read. The practice of exchanging cards began in France in the early 1800s and quickly spread through Europe. Victorian cards were simple, but lovely. Most were handwritten and designed with only a person’s name and an artistic touch. They were known as calling cards because they were passed on with the desire to call on someone in the near future and left on a silver plate in an entry if the person to be called upon was not home. As we move towards a “paperless” society, today’s type of cards are phasing out to some extent. Some people prefer to transmit data directly into another person’s phone eliminating the waste and clutter of the cards. There is a point to this but the tangible reminder that the card serves and the ability to visibly see your name continues to be valuable. When left on a desk or posted on the refrigerator the handy number is the one we call.